I wasn’t at D-Day 70 years ago. I wasn’t at Pearl Harbor 73 years ago. I wasn’t in Poland 75 years ago. But like everyone else alive today, my life has been given a context because of these events, the events which transformed the world. The context is this: In the face of tyranny, good people rise up and take a stand and put their own lives and safety on the line in service of others. The Polish citizens and their soldiers, most of whom were on foot or on horseback, trying valiantly to defend their homeland on 1 September 1939 against the Nazi juggernaut invading their country. The sailors, Marines, soldiers and airmen — along with untold numbers of civilians, who found their world exploding literally around them on 7 December 1941 in Hawaii. 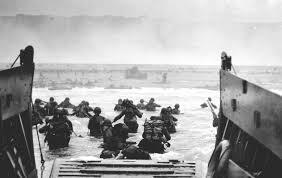 And the day we remember today — D-Day — 6 June 1944, men and women from all walks of life who had abandoned their “real lives” in order to support the war effort to overturn the Axis powers, took to the ships, landing craft, and aircraft to mount an Allied response to tyranny. All of us have family members who took part. In our family, two uncles served as paratroopers, and one of them was part of the 101st Airborne “Band of Brothers” who jumped behind the lines that day. 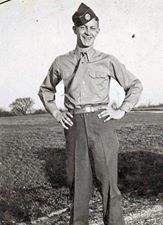 He wrote a letter a few weeks after D-Day to his brother, who had been injured in training, and that letter has become part of our family’s treasured tradition. He describes in phenomenal detail his experiences of D-Day and the days immediately following. When I first read that letter as a young boy in the 1950’s I thought it read like a movie and was too fantastic to believe. It also changed forever how I viewed my uncle, because that letter revealed a young man I hadn’t met before. When I read that letter today, as a man in my 60’s who was a career Navy officer, I see a young man like so many other young men and women who rolled up their sleeves, year after year, conflict after conflict, put their own lives on hold, and did what needed to be done without counting the cost. In my own Navy career of 22 years, going from Seaman to Commander, every duty station I was ever assigned, every place we lived, every place I was sent on duty, was because of the events of 70 years ago. Cyprus, Guam, Okinawa, Hawaii, Midway, Kwajelein Atoll, Singapore, and even the Stateside assignments — the context of our family’s life is found in the sacrifice of those men and women so many years ago. And we must never forget. In our own time, we too are called upon to serve without counting the cost. How are we doing? Will future generations look back at us and say, “They have given meaning to our lives”?